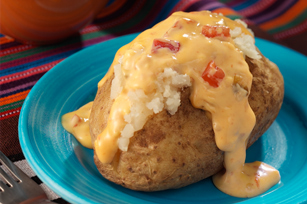 A homemade queso dip is just the right topping for a baked potato. It's the perfect combination of cheesy and spicy! Pierce potatoes with fork or sharp knife. Microwave on HIGH 18 min. or until tender. MICROWAVE VELVEETA and RO*TEL in microwaveable bowl on HIGH 5 min. or until VELVEETA is completely melted, stirring after 3 min. Cut potatoes lengthwise in half. Top each with 1/4 cup VELVEETA sauce. Reserve remaining sauce to serve over grilled chicken as part of tomorrow night's dinner.